HARDEN - SM1000 - hardenmachinery - Home plastic shredder(SM1000) - Plastic shredder - single shaft shredder by Harden Shredder Machinery Ltd. If you’re looking for plastic recycling machines, you’re at the right place. Whether you’re interested in a plastic shredder, plastic grinder, plastic granulator,or plastic scrap shredder, HARDEN delivers the absolute best plastics size reduction machinery – period. The plastic shredders machinery are particularly recommended for the processing of all kinds of plastics, independent of shape, state or properties of the material, ranging from foils, lumps, profiles We make that statement based on experience. We back it with proof from our customers. Our plastic shredding machines can be found in the largest plastics recycling plants and in the smallest. Post-consumer plastics recyclers, post-industrial plastics recyclers and companies that recycle both, consistently choose Harden shredders to do it more profitably. 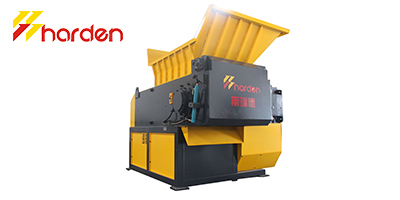 Harden plastic waste shredders play an integral recycling role in how to shred plastic in injection molding, extrusion, blow molding, rotational molding, thermoforming, blown film, cast film, and pelletizing factories. They process rejects, runners, sprues, parts, purgings, pipe, profiles, bags, bottles, bales, buckets, tubs, totes, wovens, nonwovens, film, fiber, carpet, containers, drums, IBCs, lids, - in short, anything made of plastic. No reviews were found for HARDEN - Model SM1000 - Plastic shredder - single shaft shredder. Be the first to review!